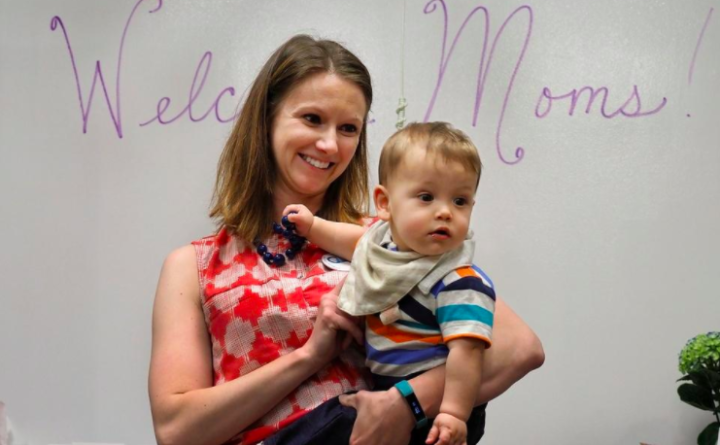 Kittery mother Becca Webb and her 11-month-old son, Logan, smile after Webb donated milk during the opening of Portsmouth Regional Hospital's opening of a human milk depot, as part of a partnership with the Massachusetts-based Mother's Milk Bank Northeast. PORTSMOUTH, New Hampshire — Got milk? Portsmouth Regional Hospital wants it, and it could end up saving the lives of babies in the Seacoast. Last week, in partnership with Mothers’ Milk Bank Northeast, the hospital opened its human milk depot, a community location where screened milk donors can drop off their extra milk, which is then dispensed primarily to premature and sick babies whose mothers don’t have enough milk for them. Nora Fortin, director of the Maternal, Child, and Women’s Health Unit at Portsmouth Regional Hospital, likened the concept to a blood bank. All prospective donors go through the same kind of screening process, including health history, physician approval and a blood test. Milk from mothers who pass the screening is also pasteurized and tested by an independent lab to ensure safety before being dispensed to hospitals or families. Fortin said the milk depot emphasizes the “exclusivity of breastfeeding,” and that feeding babies formula as a replacement “changes a baby’s gut” and gets rid of the good bacteria. Portsmouth Regional Hospital is one of 11 hospitals in New Hampshire offering donor milk. “It’s gotten a lot of great response, from within the facility and in the community,” Fortin said. Mothers’ Milk Bank Northeast, which is based in Newton, Massachusetts, sees milk donations from many bereaved mothers, as well, Cohen said. Most mothers who lose their babies continue to pump, and many choose to donate the milk in memory of their children. Cohen called it “a healing experience” for some. Mother Becca Webb of Kittery was surprised when her son Logan arrived 13 weeks early. Though he is now 11 months old and healthy, they spent two-and-a-half months in a NICU in Portland. Luckily, Webb “made much more milk than he would need,” so she ended up becoming a donor herself. For many moms whose babies are born prematurely though, they don’t yet have enough milk. Caryn Coates, of Wolfeboro, New Hampshire, is currently a second-time donor. She “filled a freezer” with extra milk when her daughter was 3 months old. “At that point, I was either donating or throwing away,” Coates said. During her first time as a donor, Coates donated around 1,700 ounces of milk. Right now, she’s close to 3,000 on her second round. With the opening of the Portsmouth location, Mothers’ Milk Bank Northeast will now have 18 depots in seven states throughout the Northeast, including four in New Hampshire. Mothers who wish to donate milk can review guidelines on the milk bank website, www.milkbankne.org/donate, then contact a donor intake coordinator for screening at (617) 527-6263 ext. 3 or donate@milkbankne.org. Approved donors can then drop off milk at the new depot by appointment, Monday to Friday, 8 a.m. to 4 p.m., at Portsmouth Regional Hospital’s Lactation Office. Call (603) 433-4086 to schedule an appointment.